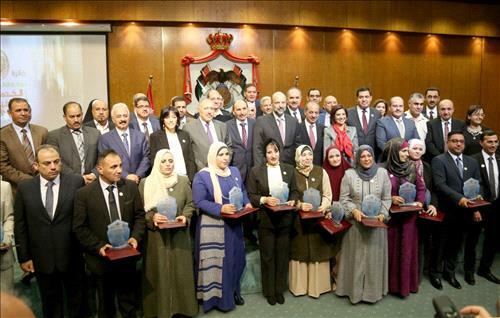 AMMONNEWS - Prime Minister Omar Razzaz led a ceremony at the Royal Cultural Center on Tuesday to honour the winners of the Ideal Civil Service Employee Award for 2017. The annual award, which is organized by the Civil Service Commission (CSC), aims at motivating employees with outstanding performance and speeding up their chances to advance to leadership positions. During the ceremony, which was attended by a number of ministers, directors, secretaries-general and members of the human resources units of government agencies, the Prime Minister distributed certificates and shields to the winners. The Council of Ministers has endorsed the Civil Service Council's recommendation to grant 20 employees of the first, second and third categories five annual allowances as of 31/12/2017 in accordance with Article (35) of the civil service law. CSC president Khalaf Al-Hameisat said that the Ideal Employee in the Civil Service Award, which honors outstanding employees in its tenth year, underlines its objectives of promoting excellence and creativity and motivating employees with distinctive performance to innovate and develop their skills to become leaders.